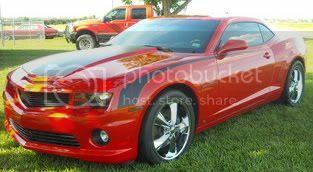 I know more people are looking for a place's to take their Camaro's to, so anyone wanting to meet with other 2010's in Polk County Florida, then here is a heads up notice. Every 3rd Friday night from 6-9pm. Downtown Bartow FL. No entry fees! Free dash plaques. All Cars are welcome, old and new! Any make, any model. Yep, even M**tangs! (Although we might have to have you guys park somewhere else) I like stangs too! Great folks and beautiful cars. Lots happen during these 3 hrs. besides just the cruise in. Bring the kids with you! Downtown streets are blocked off and lots of activates are happening. Lots of food venders, wet slides and the bounce house. Adult fun too, Including live bands and beer! People love to look at all of the cars, but there is just something about this 2010 Camaro that keeps the crowds checking out this machine more than ALL the others. Come this month, and come next month. Come every month. Put it on your calendar right now and plan for it! We'll block off a whole Street just for the 2010's if we need to! If you're looking for a cool place to meet up, then you've found it! All you have to do now is just show up! Whether you're local or out of the area, this is the place to be! I will be posting more information in the coming days ahead! I will also post phone #'s to call for information! I have gone to many of those and never known they had cars there! Hmm....guess we never made it around the whole thing. Good to see more local Camaro owners! BTW nice color choice! May have to make it out there this Friday night! Ordered 1/30/09 as a surprise for me by the best husband ever! Delivered 8/6/09 to me!!! Great! Glad to hear others are coming out! Bartow "CRA" Community Redevelopment Agency"
65 Cars last month and growing! Call "Gail" or "Jim" at (863) 534-0121 for any needed info. about the Friday Fest or Car Cruise In! Due to the extremely bad weather coming our way, all events have been cancelled. Maybe November will bee nicer to us. Plan for Nov. 20th 6-9pm. See yaw'll next month...be there! Plan now!!!! !